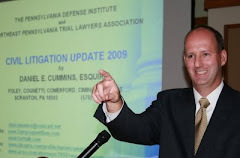 In the June 22, 2009 post below entitled "Recent Jury Verdict Entered in Pike County in Automobile Accident Case," I incorrectly listed the Plaintiff's counsel in the Beach v. Schaefers and Diaz case. The correct identity of the Plaintiff's attorney is Danielle Mulcahey, Esquire of the same law firm listed of Wright and Reihner of Scranton, Pennsylvania. The correction has been edited into the post below as well.